1. rig counts in Canada are down 50% over last year, on year-to-date statistics. This means there are about half the number of drill rigs actively exploring for oil and gas right now, so far this year compared to 2008. And the percentage of rigs being used is also down – it’s about 50% right now – it was roughly 70% this time last year. Less rigs means less new discoveries means less supply. U.S. Rig Count down 43 from last week at 1,472; down 291 year over year. Canadian Rig Count up 6 from last week at 432; down 161 year over year. 2. Storm Exploration, (SEO-TSX) which I mentioned yesterday, has chosen not to produce its latest well at full capacity because of low natural gas prices. Expect this trend to continue. strangely enough, for many of the junior/intermediates, they keep producing even at these low prices, even if they are barely breaking even, because they have fixed costs in the field, such as pipeline/transmission costs. Producers have to pay the pipeline companies to take their gas, and sometimes that’s hard or fixed contract. Of course, that’s bearish for prices. That doesn’t mean there aren’t some natural gas weighted companies worth buying – just not yet. Analyst target prices are still based on too-high price forecasts. Natural gas could definitely have a technical bounce at any time that could take it 50 cents higher or so – and all the gas weighted stocks with it – but don’t count on a sustainable rally. If you’re a trader, be nimble. 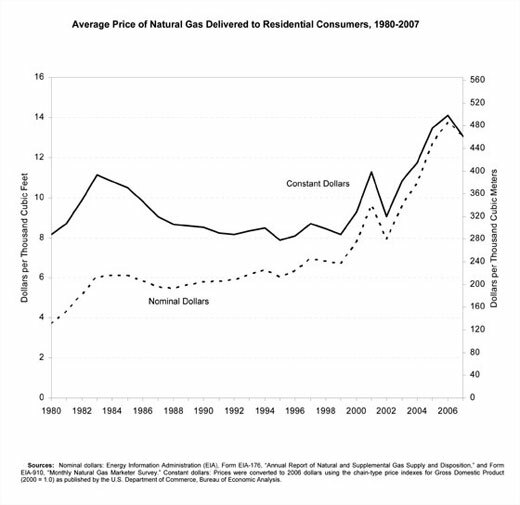 See this chart on natural gas prices in the US from 1980-2007 – see how there was an 8-10 year consolidation of prices between 1982 – 1995. I see a strong likelihood for a similar pattern over the next few years. Unless there is something from left field, like President Obama creating a huge incentive to build & buy natural gas fuelled cars or something of similar, but unlikely, ilk.